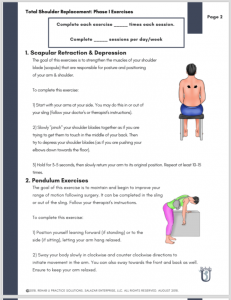 Do you work in an outpatient therapy clinic treating shoulders? Have you ever had to treat a patient recovering from a total shoulder replacement surgery? Have you always felt intimidated treating patients after they’ve had total shoulder replacement? If you answered “yes”, then this free resource is for you! Given the growing elderly population, total joint replacement surgeries have become more common. It seems that those of us who work in outpatient clinics seem to be seeing more and more patients following total joint replacement. This was especially true for me when I worked at the local VA Medical Center. The most common joint replacement we saw in our specialty clinic was the total shoulder replacement. Whether it is a standard (or anatomical) shoulder replacement, or a reverse total shoulder replacement, I noticed many clinicians feel intimidated when treating a patient who has recently undergone shoulder replacement surgery. 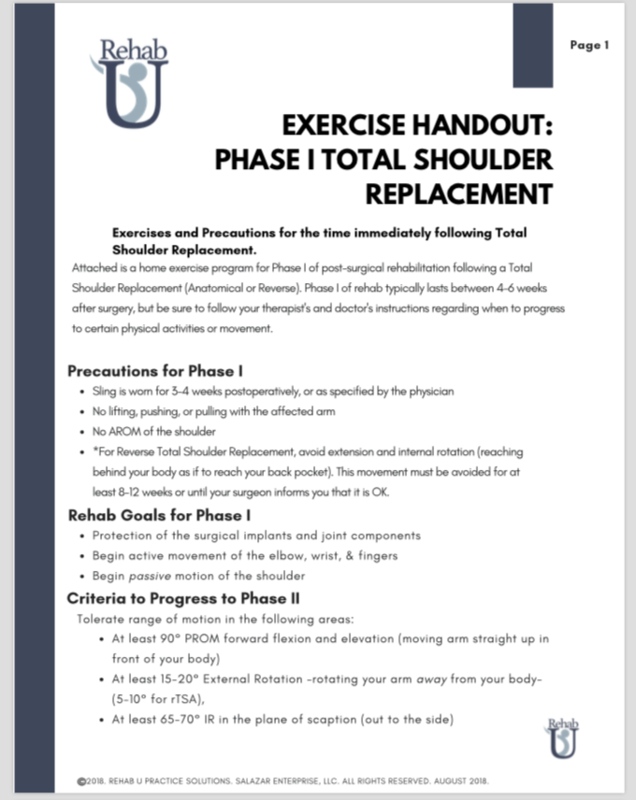 This handout is a summary of an article written about total shoulder replacement rehabilitation here, and also contains a basic rehab protocol to help guide treatment. Now different hospitals, clinics, and surgeons may have variations in the timelines and may even delay or advance different exercises and activities, but this is a good, basic, and evidence-based protocol to guide treatment if you are in need. It’s always a good idea to keep an open line of communication with the surgeon or their office to make sure that everyone is on the same page when it comes to the rehab protocol after any surgery. This is a great hand out to use as a reference and to provide to patients as an educational resource. Check out our resources page for additional educational and clinical resources! You can also check out our Blog for regular articles covering everything from clinic management to education & research! If you’re interested in seeing how we can help your clinic improve patient experience and grow your business, check out our services page to see what we offer and what a typical engagement looks like.